It's always a great solace to me as a non-believer, that the Bay Area offers so many interesting forms of non-traditional cultural fare during the holiday season. For instance, one of the highlights for me personally last year was finally making it over to Berkeley's Cal Performances to catch the Mark Morris Dance Company's irreverent take on The Nutcracker, The Hard Nut. This year, I've moved from hard nut to hard rock, as the best thing I've experienced so far has been a musical by The Climate Theater, a small local theatre company, entitled The Man of Rock. 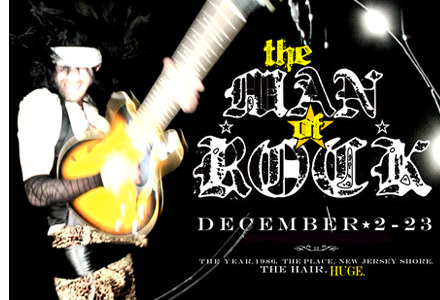 A world premiere written by Daniel Heath with music by Ken Flagg based on George Etherege's 17th century comedy of mannersThe Man of Mode, The Man of Rock is rather atypical for a holiday season show in that it has nothing to do with Christmas or any other festival. It's a musical adaptation set in the rock music world of 1980s New Jersey. What makes The Man of Rock great holiday fare (or indeed great fare for any time of year really) is that it's quite clever and completely entertaining. Despite a couple of transition / timing issues between beats, a slightly flat performance by one actor (alas he plays the main character but somehow I didn't seem to mind him being upstaged by the other talented cast members who fully embody their roles) and some glam rock music schtick like jumping up and down from the speaker during the musical numbers which gets a bit boring through endless repetition, the production makes for a lively way to spend a couple of hours on a dank night. If you're sick of choral concerts and drag acts and happen to be in the Bay Area this week, head over to the Jewish Theatre to see the show in its closing performances. It runs till Dec 23. Appealing part of substance. Almost same is here http://motivationgrid.com/secrets-for-getting-motivated/ I just discovered your site and in increase cash-flow to assert that I get truth be told delighted in record your blog entries.